This is my final cookie in the Saveur Cookies We Love event, a spiced molded cookie from the Netherlands. 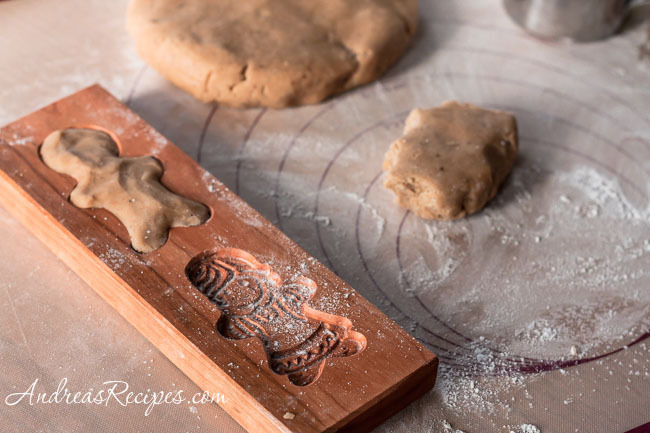 Molded cookies are common in Europe and the tradition is often passed down through families along with the old wooden cookie molds. If you are fortunate you may even have an heirloom mold that’s been in your family for years. My family doesn’t have that tradition so when I chose these cookies I needed to find a mold or two. First I found some Wilton metal cookie molds at a brick and mortar store, and I chose one with gingerbread houses because I thought the boys would like those shapes, but I continued searching for a good wooden mold. My search led me to Gene Wilson, a retired biology teacher in Illinois who makes gorgeous traditional cookie molds out of cherry and beech wood. He doesn’t use patterns; each mold is started from scratch, and though he makes several of each style they are all unique. I spent a lot of time searching through his extensive catalog of molds trying to select the mold that would make our cookies this year. I finally decided on the dual gingerbread kids board, though I also had my eye on the nutcracker and a few others. After placing the order I received the mold about a week later, and Gene included a booklet about making molded cookies. I also purchased a copy of a book he recommends, Baking with Cookie Molds by Anne L. Watson, which thoroughly covers the history of baking molds as well as recipes and helpful tips. After my first attempt at the cookies didn’t exactly turn out stellar, I tried again and got a better result. Through reading some of the recipes in Watson’s book, I learned to chill the cookies a bit before baking and that cookies will release much better from the molds if you use honey rather than sugar, and honey is more authentic anyway. The flavor of the Saveur speculaas cookies is very good, like a mild gingerbread, and my boys enjoyed helping to make the cookies. I taught Monkey Boy how to flatten a small piece of dough into a disk then press it into the gingerbread house pan. He got the hang of it and set off to make his own hand shaped abstract cookies. He was quite proud of himself. I think these cookies, or some form of them, will become a family favorite because of the shapes, the flavor, and the process. The boys were very excited to see the cookies coming out of the oven and couldn’t wait to dive in. The gingerbread mold I purchased form Gene Wilson is gorgeous, carved from a piece of cherry with a beautiful grain and color. I think he does fantastic work. In celebration of the holidays and because I like these so much, I’m giving away one of his cookie molds, the medium Nutcracker (above), and a copy of Watson’s book to one lucky reader. 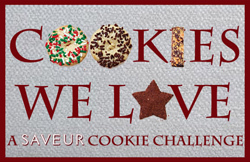 To enter simply leave a comment below and tell us about your favorite Christmas or other holiday cookies, and if you’ve made molded cookies we’d love to hear about them. Giveaway is open to residents of the United States and Canada. One entry per person, please. The giveaway closes at 10:00 pm EST on December 24, 2010. Random.org will select the winner and I will contact the winner immediately. The winner must respond with 48 hours and provide a mailing address for shipping purposes. If the winner does not respond within that timeframe another winner will be selected. Disclosure: I’m am sponsoring this giveaway myself and paying for the prizes. I was not solicited by anyone to offer this giveaway. The giveaway is now closed. Thanks to all who entered! Congratulations to amy for winning the cookie mold and book! And finally, thanks to all my cooking baking friends, especially to Courtney for getting us organized, and to Claire for making our logo. I look forward to baking with you all again next year! 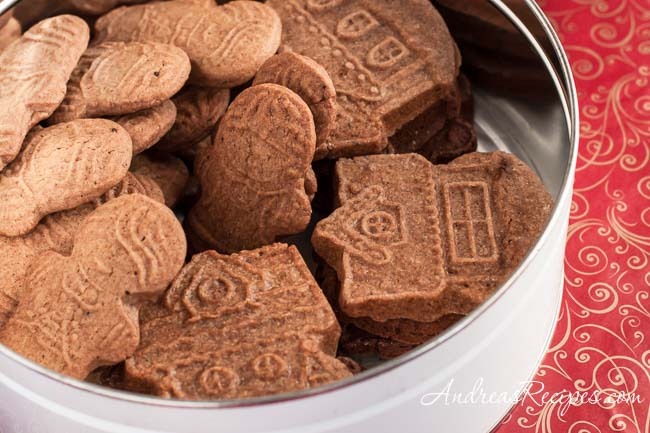 I love pretty much all cookies… but speculoos are my favorites! I discovered these cookies in Europe and LOVED them. I think your molds are gorgeous and I can’t wait to try these out myself. THESE are my favorite! We first discovered these when we were stationed in Germany in the early ’80’s. We have warm and special memories of enjoying Speculaas in Belgium along with divine Hot Chocolate after shopping at the Christmas Markets. These molds are gorgeous. Wow those molds are just exquisite. Ive never seen anything like it! I love peanut butter blossoms, reminds me of helping my mom in the kitchen when I was little. I haven’t tried molded cookies before, so winning would be great! I found this this to be rather timely. I was born in Holland and immigrated to Canada with my parents when I was seven. Like all persons with a Dutch background, we are very fond of speculaas. Just yesterday, I went to a Dutch grocery store here and purchased speculaas kruiden – the spice mix traditionally used in speculaas. I have plans on making speculaas tomorrow but alas, I do not have any molds. Instead, I will roll the dough and use Christmas cookie cutters. I will also brush one side with beaten egg white and press some sliced almonds into the cookies prior to baking them. Thank you for the article. My favorite cookies at Christmas time are molasses which I cut out like gingerbread men, however I would love love to try these molded ginger cookies because my husband finds the molasses cookies to have too strong of a taste and prefers his mother’s ginger cookies which I find to taste more like a sugar cookie, so this ginger cookie recipes sounds like it will fit both his and my tastes perfectly (thats what marriage is about right, coming up with new traditions together). Through the years decorated sugar cookies have been the most fun to make, but now with all adults in the family we are more focused on how the cookies taste. Our favorite cookies this year are Pecan Tassies – they sound just as Southern as they taste – a lot like little pecan pies. What amazing wood work – it really emphasizes the traditional care once taken with preparing for the holidays – every aspect of food and festivity being part of a family’s heritage. You are so generous to be sharing this way – hope you and your family have a lovely holiday season. Our favorite holiday cookies are pumpkin spice drops with browned butter icing. They are delicious, but not pretty like these. I’ve never tried molded cookies but I need to as I’m artistically bankrupt and need all the help I can get! oo these are so pretty! I have to say that almost every cookie has its merits. 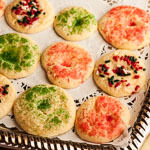 [: however, i like holiday cookies with a little spice to them! Gorgeous cookies! We love speculaas with a passion! Thank you so much for this recipe! I bake dozens of dozens of Christmas cookies every year. 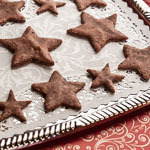 A few are traditional cookies from recipes that have come down in my family, but many are recipes that I brought home from my time living in Germany as a military wife more than 40 years ago. 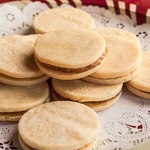 I have baked Springerle many times, using to Springerle pins that I brought home, but I’ve been hunting this recipe for many a year as these were one of my mother’s favorite cookies. She used to buy these in packages, always in the shape of windmills, but how she would love this glorious nutcracker! This year’s list: Pfefferneuse, Lebkuchen, Mushroom Cookies, Swedish Dreams, Coconut Dreams, Cherry Bon Bons, a new recipe for a Mexican Wedding Cake made with tapioca flour, cinnamon and teeny chocolate chips, Coconut Macaroons, Hazelnut Biscotti and countless cut-out sugar cookies. Oh – Lemon Bars, Butterscotch Brownies, and if I have the time to run out for dates, some Date Bars. LOL. I suppose you couldn’t begin to guess what everyone is getting for Christmas? My parents brought me back some wooded springerle molds from the Christmas markets in Germany. I’m planning to try them out this week. Interested in your comment that honey makes the dough release better than sugar. Did you use honey instead of the sugar in the recipe you give above? Hi Hilary. No, I haven’t tried the honey yet as recommended by Ms. Watson because I didn’t get the book until after my attempts at the cookies, but definitely will try it next time. Oh Andrea, what a gorgeous molds! Really the best craftmanship made with such love for the product! And.. they release pretty well with fine detail! You did a great job! I wrestled with my molds for a while but found that when you brush them with rice flour every once in a while during shaping the dough will release quite easily keeping the details. I love speculaas. It’s not Christmas without them. I’ve never made a molded cookie but that is beautiful! I don’t know if this is considered a Christmas cookie, but my grandma only made them at Christmastime so they’re Christmas cookies to me…my fave Christmas cookies are snickerdoodles. I always loved the touch of cinnamon sugar on the top. So yummy! Oh they look so delicious. I love the molds too. I had a lot of fun doing cut out cookies with my children. They just love the process. My favorite holiday cookies… this is completely un-glamorous, but I confess that the gingerbread cookies from Mother’s (the same company who does the pink and white circus animals) were my favorite holiday cookies ever! Seeing those bags on the shelves at stores always brought in the season for me. Unfortunately, they don’t make them any more. ): All the more excuse to make my own! These speculaas cookies look amazing. Biscoff cookies are my favorite speculaas that you can purchase at Walmart and Walgreens. Also, I recently found Biscoff Spread. You enjoy it just like a Nutella or peanut butter. Lebkuchen, is probably my favorite cookies. I discovered speculaas when I studied abroad in Belgium. I can’t wait to try to make these! I like to use them as the crust also when I make pumpkin cheesecake. Pepparkakor, is honor of my Norwegian ancestors and buttery shortbread in honor of my Scottish ones. Both have qualities that may do well with this mold. One of my best friends lives in Belgium. Every time we see each other she brings me speculoos cookies or speculoos spread (which is amazing and you should try it). I have made the cookies recently but just using cookie cutters. When I was looking for a mold/recipe I stumbled on your website. They look amazing and that nutcracker mold is absolutely gorgeous. Such a time-consuming cookie but worth all of the effort. I love making Christmas cookies. My Christmas Biscotti and Cut-out Sugar Cookies are two of my favorites. I have some of Gene Wilson’s cookie molds and have made the Speculaas before. 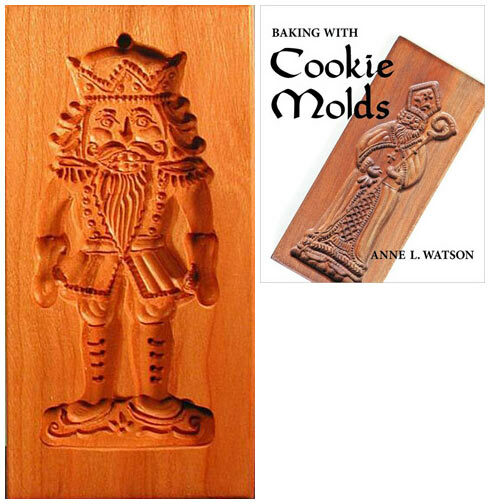 I would be thrilled if I won his Nutcracker cookie mold and Anne Watson’s cookie book. Those are beautiful. I would love to try the molded cookies. Oops, I didn’t reads well enough the first time. I made the gingerbread cookies from Bittman’s How to Cook Everything fir the first time this year, and they were great. Ooh, these molded cookies are absolutely gorgeous. My favorite holiday treats are definitely ginger bread, ginger snaps, or anything with lots of spice. The molds are gorgeous! My girls love making cookies the more diverse the better. However, we have never used molds and would love to try. At the moment, we are enjoying thumbprint cookies, mainly because we are using up all the excess jams that we have in the fridge so that each cookie center becomes a mystery. Have a wonderful holiday! My favorite Christmas cookies are the food-colored butter ones my mom made every year with me and my two younger sisters. I am starting the tradition with my two sons and would like to add our own cookie to the rotation. 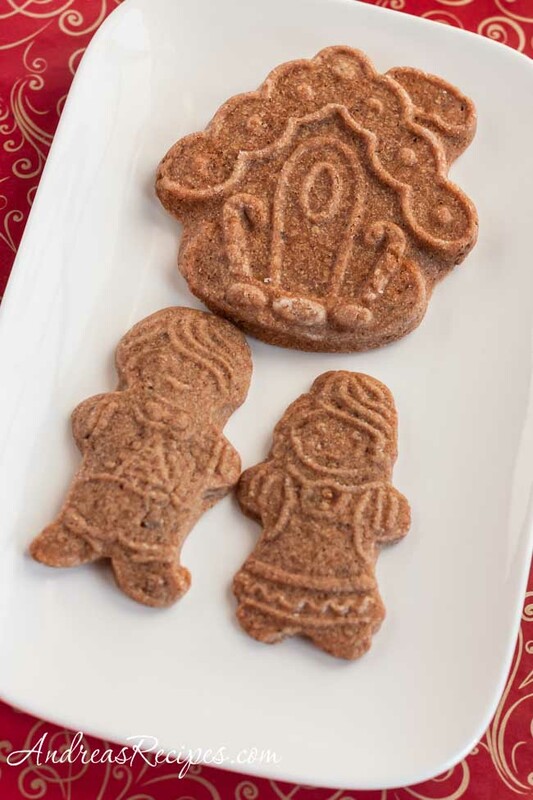 You had me at Speculaas! My brother brings it back from Belgium by the jars full when he comes at Christmas. It is a favorite in our house. I love the mold too, how sweet. Thanks for the recipe. Looking forward to making it. I purchase a Witch’s fingers cookie mold that didn’t come with a recipe for the cookie dough. 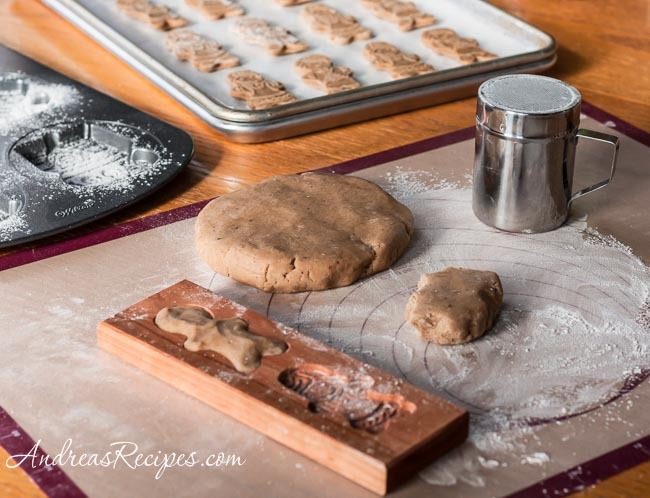 I did a search for a recipe and that is how I found your site with Andrea’s ginger cookie recipe, now I am excited to make those cookies also in the nutcracker cookie mold. I hope the cookie mold is still available and the book on “Baking with Cookie Molds” would be very helpful.